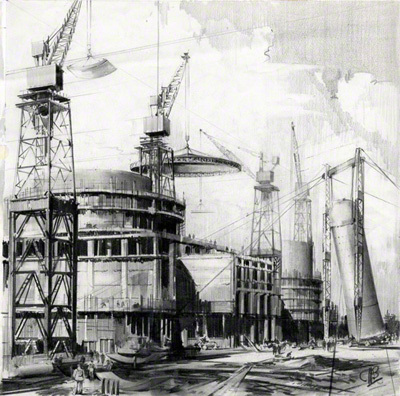 This pencil drawing shows the construction phase of the Nuclear power station Berkeley on the river Seven. Several activities are being shown. In particular the installation of one of the boilers which weighs 300 tons. 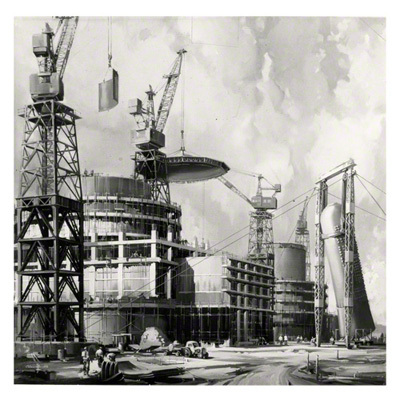 This drawing by Claude Buckle was made for a proposal of the finished oil painting shown in the photograph below and was commissioned by the consortium of AEI and John Thompson (Wikipedia). The picture was of a considerable size probably in excess of 60“by 60”. It is not known where the original oil painting is. Created in 1956. This is a photograph of the finished oil painting for which the pencil drawing above was a proposal.